In total, about 13 people (including me) provided testimony to the Committee. People spoke on both sides, for and against, with the majority in favor of the H.B. 2293. While some opposition to reform has used scare tactics – such as incorrectly suggesting that noncompete reform will somehow prevent companies from protecting their trade secrets or that companies will suddenly be exposed to all sorts of corporate espionage – the testimony today did not take approach. Rather, of the people voicing opposition, most seemed to acknowledge that reform would be positive, but took issue with only (a) specific aspects of the bill (H.B. 2293) or (b) its timing, suggesting that making changes in the current economic climate would not be desirable. In contrast, Secretary of Housing and Economic Development Greg Bialecki made it clear both that reform is necessary and that the Patrick Administration believes that now is the time. Accordingly, Secretary Bialecki urged people to get around a table and resolve the outstanding issues (lest the result may be the elimination of noncompetes altogether). Throughout the process, the sponsors of the bill, in particular, Representative Lori Ehrlich (who co-chairs the committee) and Representative Will Brownsberger, have been endeavoring to do just that. In furtherance of those efforts, countless hours have been spent working with myriad individuals, companies, and associations toward a bill that strikes an appropriate balance between the legitimate business interests of employers and fairness to employees. It is for that very reason that the outstanding issues are relatively few. 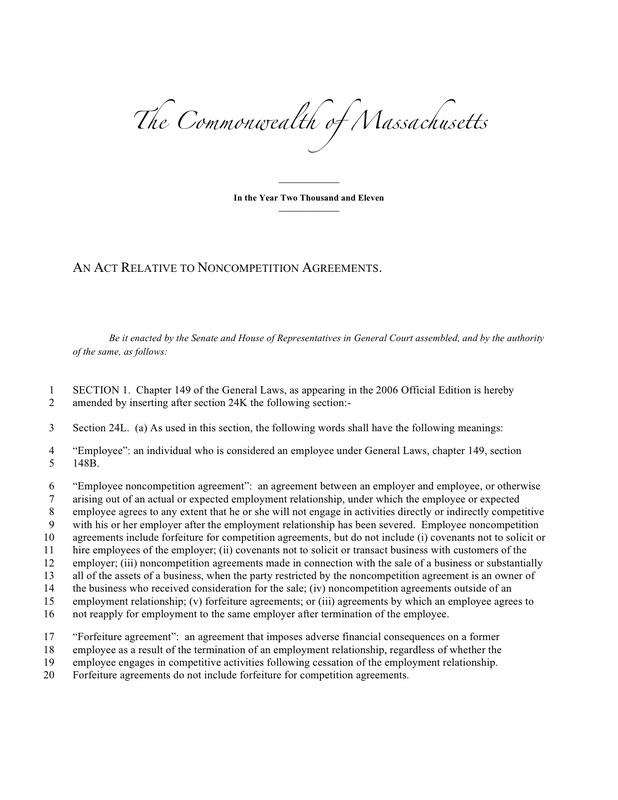 At the moment, the main outstanding issues appear to be: (1) the provisions regarding attorneys’ fees; (2) the ability of the courts to consider equitable factors in deciding whether to enforce a noncompete agreement; and (3) certain requirements concerning paying employees for noncompete agreements when the agreement is imposed after the employee has already been working for the employer. (For more details on the bill, see here.) While the attorneys’ fees provisions are not currently part of Massachusetts law, the courts’ ability to take equitable factors into account most certainly is, and the concept of payment for the agreement is the subject of much debate among lawyers who regularly practice in this area. I expect that these issues will continue to be the subject of much discussion. If you have input, we would be extremely interested in hearing from you.